UMass FAC and library--two awful buildings in one photo! Note FAC interior below--just as comfortable as it appears. And, yes, those are balcony seats in the back--like watching an event in Iowa from Indiana. Years ago I was sitting at a faculty meeting in which plans for a new student center were unveiled. They were impressive–sculptural angles, exposed wooden beams, and a soaring glass atrium entrance. When the ooohs and ahhs ended I raised my hand and noted that the atrium had a southern exposure. “So what?” I was asked. “So are we building a student center or a greenhouse?” I asked. “I’m sure the architects have thought of this,” was the answer. 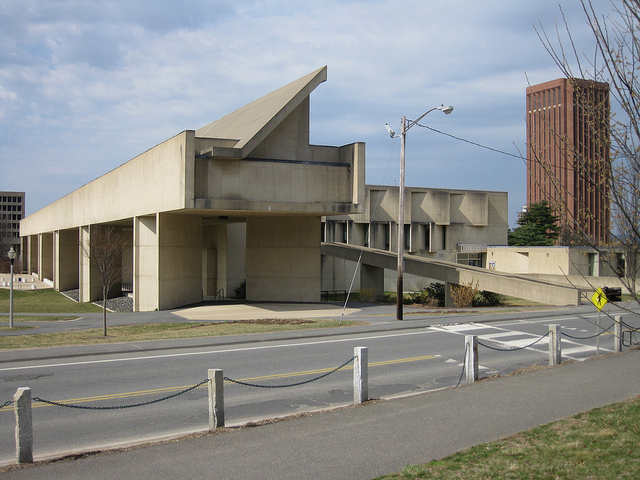 “Don’t presume this,” I replied, “Western Massachusetts is littered with campus buildings that are architectural mistakes. And while we’re on the subject, the current blueprint is an impressive design, but the interior space is rather impractical.” Let us just say that the building was rethought and its atrium now has a northern exposure. On the other side of Amherst–at the University of Massachusetts–sit two monumental architectural follies, and I do mean “monumental.” There is, first of all, the 26-storey university library, as ill-conceived an idea as ever imagined. The whole point of a library is that one can browse in it. Try that on 26 floors. Try finding a book in a run that might begin on floor 17 and continue on floor 14. Spalling bricks have also plagued the building, a potentially fatal problem if one was struck by a chunk falling at 32 feet per second. This necessitated the construction of a concrete canopy around the structure as well as limiting access to one side. There have also been problems with weight distribution, which meant that books had to be limited to every other floor and the library’s final four floors are below ground level, which means there have been major moisture problems (which is why the archives are on the 24th floor). As bad as the library is–and it’s horrible–it’s a Taj Mahal in comparison to the Fine Arts Center (FAC). A poll of Massachusetts residents recently declared Boston’s City Hall–allegedly cutting edge architecture designed by wicked famous architects when it opened in 1968–as the ugliest building in the Commonwealth. That’s because more people live in Boston; I’m sure if they ventured west they’d agree that the UMass FAC is way uglier. Legend holds that the FAC is supposed to look like a piano from the air–as if musical instruments were built from un-faced concrete slabs. That story may be apocryphal, so let’s dismiss it. I’ve always said the FAC was proof Albert Speer got out of Germany after World War II. It is a (mostly) windowless monstrosity of gloom and soullessness. The FAC has a wonderful arts series each year, but I have to really want to see an event before I subject myself to Spartan conditions that would have made East Berlin residents tear down the Wall decades earlier. Architects must not be allowed to use their reputations as a way of duping the public. I am aware that the public is generally conservative and that such great structures as the Eiffel Tower and the Empire State Building were once ridiculed as eyesores. (My own bias is that I simply hate glass-and-steel functionalist architecture.) I’m not against innovation or design, but no building–especially one underwritten by taxes or tuition payers–should ever be approved by administrators, CEOs, or management alone. Such decision-makers are too susceptible to clever sales pitches and often don’t understand how a building must function. Designs should have to pass muster of, first of all, independent engineers to determine if the site and design are even doable. It’s also a good idea to make sure that users and workers approve the plans as well–they are the ones who understand how the building needs to function, not some guy fiddling with a CAD program. Finally, somebody with moxie needs to have the guts to say from the outset, “No–this isn’t good enough” if it’s not. Who wants to spend $19 million on a mistake, or be condemned to decades of cheerlessness because of some architect’s lousy idea?